This post has been updated to reflect additional reporting done the week of the NBA Draft. Jaylen Brown has been quite busy in his typical eccentric fashion since coming to New York City for the draft. Brown took a tour of the Marshall Chess Club and played against chess star Nico Chasin, 9, the national champion for his age group, on Tuesday night. He did a autograph signing at Modell’s sporting good store in Manhattan on Wednesday afternoon and was disappointed he couldn’t attend Steve Nash’s Charity Soccer Game at the same time. He hosted a dinner for family and friends with Thomas at the Atwood, Kitchen & Bar Room on Wednesday night. Amongst his many media obligations, he went to Sirius Satellite radio to be interviewed for “Sway In The Morning” on Thursday and also had a photo shoot with SLAM Magazine on Wednesday that he went to on his own after taking an Uber. In the NBA Draft Green room, Brown will be joined by his parents, grandmother, brother and mentor, Steve Bouye while close friends and family members will be in the stands in Brooklyn. Brown also plans to attend a post-draft party that conscious rapper Talib Kweli is performing at. So how does Brown feel with the draft arriving? “I wouldn’t call it excited. I would say ready. I overly ready. I am ready to get to the city that I get drafted by. I am ready to dive into the culture, the community. I’m ready to get started. I’m ready,” Brown told The Undefeated. Say hello to Brown, the most interesting prospect of the 2016 NBA draft. Brown averaged 14.6 points and 5.4 rebounds as a true freshman for the University of California-Berkeley last season and was named the 2016 Pac-12 Freshman of the Year. After Cal was eliminated in the first round of the tournament, Brown quickly decided to forgo his remaining college eligibility and enter the NBA draft. While Duke’s Brandon Ingram and Ben Simmons are widely regarded as the top two draft prospects, the Philadelphia 76ers, which has the first pick in the draft, is also expected to work out several others, including Brown. 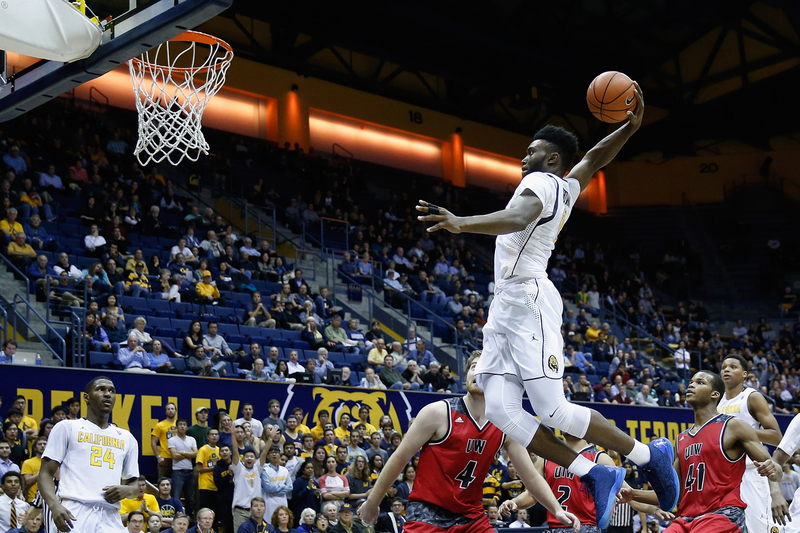 Jaylen Brown #0 of the California Golden Bears dunks the ball during their game against the Incarnate Word Cardinals at Haas Pavilion on December 9, 2015 in Berkeley, California. Brown could work out for all the NBA teams drafting in the top eight and is expected to begin visiting teams next week, a source said. Brown would love to work out against Simmons and Ingram and is looking forward to his NBA workouts. “I got an opportunity. It’s time to take advantage,” Brown said. “He is an extremely intelligent kid,” the NBA assistant general manager said. “He took a graduate school class at Cal in his freshman year. He is a person who is inquisitive about everything. Because he is so smart, it might be intimidating to some teams. He wants to know why you are doing something instead of just doing it. I don’t think it’s bad, but it’s a form of questioning authority. Brown interviewed five well-regarded NBA agents to potentially represent him. He ultimately decided to enter the draft without an agent, with the collective bargaining agreement already slotting the salaries for two-year guaranteed rookie contracts (which come with an option for two-year extensions). Brown instead is relying on a unique circle of advisers, including Hall of Famer Isiah Thomas and former NBA All-Star and Cal star Shareef Abdur-Rahim, who made him feel comfortable and confident about not hiring representation. Brown’s circle of advisers is overseen by Cal alum and AAU Oakland Soldiers co-founder Hashim Ali. Brown said Cal men’s basketball head coach Cuonzo Martin introduced him during his recruiting visit to Ali, who is earning his doctorate from Cal’s school of education and is a former director of basketball operations at Florida International University, where Thomas once coached. Ali is handling Brown’s daily schedule and is setting up meetings with NBA teams. Ali introduced Brown to Thomas. The former Toronto Raptors president, NBA head coach and two-time NBA champion has become Brown’s main adviser. Brown described Thomas as a “tremendous resource” and talks to him daily. “He’s one of my favorite people on the planet. I found a kindred spirit with Isiah Thomas. We bounce things off each other and I absorb so much every time I talk to him,” Brown said. Thomas said Brown is already very familiar with the NBA’s collective bargaining agreement and the rookie contracts. Brown has also already met NBA commissioner Adam Silver and National Basketball Players Association (NBPA) executive director Michele Roberts. Brown, who is African-American, has a predominantly black advisory team. NBA agent Aaron Goodwin is aiding Brown with his shoe deal and off the court business interests (but will not serve as his agent); NBPA executive vice president Chryssa Chin; Jabari Mahiri, Cal’s associate professor of education and chair of the Language, Literacy, Society and Culture program; basketball trainer Ansar Al-Ameen (who previously has worked out Simmons, Cleveland Cavalier LeBron James, New York Knick Carmelo Anthony and other NBA players and travels with Brown); Base Ventures founder and managing director Erik Moore; and Derek Van Rheenen, who directs Cal’s cultural studies of sport in education master’s degree concentration for students studying the intersections of school and sport and is the only non-African-American in Brown’s circle. Brown was a five-star recruit whom ESPN.com ranked only behind Australian Ben Simmons in the Class of 2015. The Marietta, Georgia, native turned down college basketball powers, such as Kentucky, North Carolina and Kansas, to go to Cal. Cal had not been to the NCAA basketball tournament since 2013, before Brown’s arrival, but he was very impressed with the academics of the school, recently ranked sixth-best among universities worldwide by Times Higher Education. He actually paid for his own visit to Cal after using all of his five allotted official college visits. 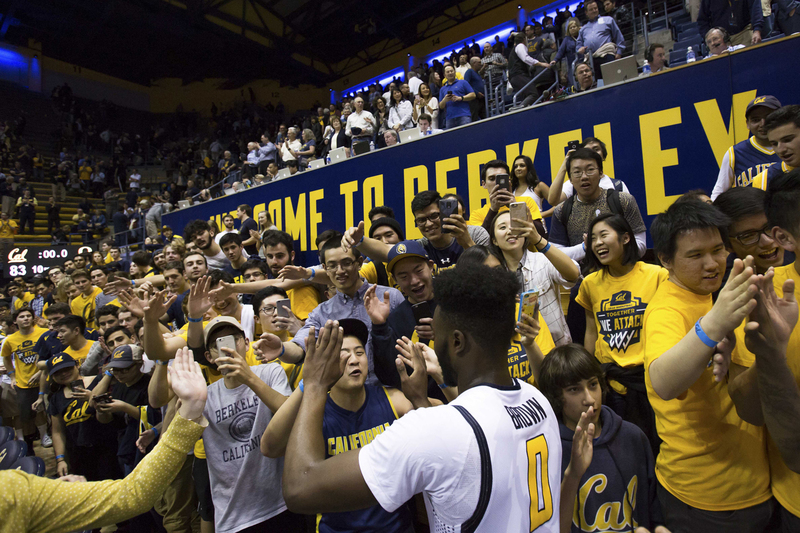 California Golden Bears forward Jaylen Brown (0) celebrates with students after the win at Haas Pavilion. The California Golden Bears defeated the Oregon Ducks 83-63. The university is set in Berkeley, the small Bay Area city known for decades as a haven for folks with varieties of quirks, interests and eccentricities. Brown is neither a square nor what some might broadly stroke as a stereotypical American jock. Here’s a snapshot: He learned Spanish during his freshman year at Cal and said that while improvement is still needed, he is confident he can conduct interviews in the language. He said being bilingual is good for personal growth and for business and he wants to learn three more languages by age 25. He took classes such at Cal on global poverty and practice, theoretical studies and student activism as a freshman, because he wanted to be able to debunk “a lot of misconceptions about people who are poor, homeless or etc.” He owns and can play an acoustic guitar (“I’m not going to toot my own horn. I’m all right.”). He interned two months at Base Ventures with Moore (“I was happy to find out that Jaylen was very keen to learn and take advantage of the tech eco system that thrives right in his backyard,” Moore said). Brown keeps a journal instead of relying on his phone. He uses it to write down all the “great advice” he gets from mentors. He also enjoys vegetarian cuisine and doesn’t eat pork or red meat. He’s a huge soccer fan who can speak as knowledgeably about FC Barcelona and Arsenal as he can about the Cleveland Cavaliers and the Golden State Warriors. “When I walked into the chess class at Cal, the people were looking at me like I was lost and in the wrong class,” Brown said. One of Brown’s closes advisers is Hall of Famer Thomas, who might have played with the most eccentric of all NBA players in fellow Hall of Famer Dennis Rodman. But from a mental standpoint, Thomas also recognizes how unique Brown is. Brown said his team of advisers is “helping me build my brand.” As such, he’s already taken to heart that the NBA is a business. Case in point, during the NBA pre-draft camp in Chicago he attended interviews with teams wearing a suit and tie. Most prospects arrive wearing slacks and a dress shirt. Brown also brought a notebook and pen with him to take notes. NBA prospects with agents typically work out at locations handpicked by agents and/or their agencies in preparation for the draft. Brown — still living in an apartment with Cal freshman big man Ivan Rabb, eating at the school cafeteria daily — is working out with Al-Ameen at a recreation center on Cal’s campus and places like Oakland, California’s, Jam Town basketball facility. He continues his strength and conditioning workouts in a weight room on Cal’s campus. Brown also likes old-school hoop knowledge. Along with getting words from Thomas and Abdur-Rahim, Brown has talked to two-time NBA champion Bill Laimbeer and former WNBA star Teresa Weatherspoon about defense. He’s spent time talking to former NBA champion and head coach Brian Shaw, Milwaukee Bucks coach and former NBA and Cal star Jason Kidd and has worked out with Chicago Bulls All-Star Jimmy Butler. Brown is currently taking part in two-a-day solo basketball workouts that begin either at 5:30 a.m. or 6:30 a.m. Why? Shaw told Brown that five-time NBA champion Kobe Bryant used to work out that early. He’s been working out primarily on ball-handling, defense, shooting, transition scenarios and being smarter offensively. “I feel like nobody else is doing it,” Brown said. “I heard stories that Kobe Bryant wakes up at 4 or 5 and he’s at the gym at 5:30. He’s fully drenched in sweat by 6:30. He hits the weights after at 8 and then he starts practice at 10 back in the gym. All that Kobe has accomplished has been by a relentless work ethic.